The week of Jan 26 - Jan 31st is the week of the Florida Hospital Lady Track Shack 5k and it is all about the ladies. Track Shack will be buzzing with 3,000 women excited to run and walk the 5k with friends and family. Orlando will have 3,000 more tu-tu wearing women because each women receives a tu-tu with the 5k registration. The community support for this event has been overwhelming and the race has reached capacity! Whether you are running the race or not, you can book your mammogram and get fit for a Moving Comfort bra. If it’s time to purchase a bra, consider the Moving Comfort. Brooks is giving a FREE tech shirt to anyone that purchases a moving comfort bra, beginning January 9 until supplies last, of course! Are you intrigued? Then join us! Jan 26: Mammogram Monday at Track Shack. 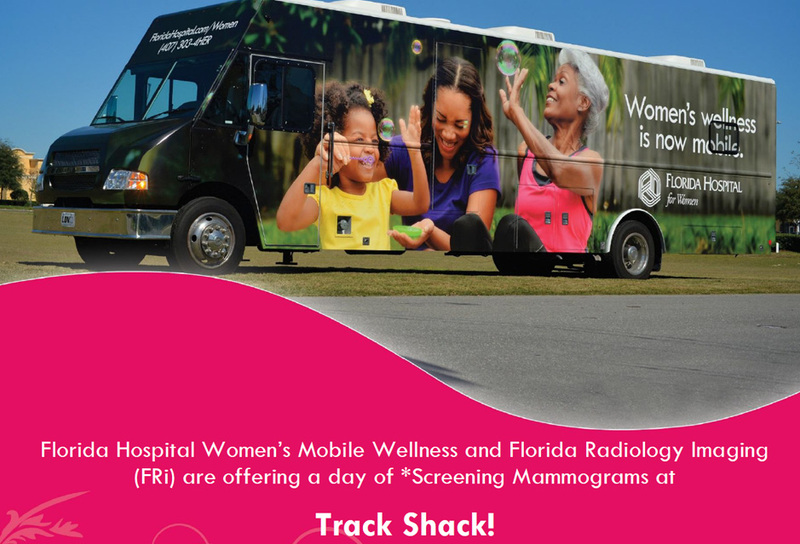 Florida Hospital Women’s Mobile Wellness and Florida Radiology Imaging (FRi) are offering a day of Screening Mammograms! Call (407) 303-1615 to schedule your screening mammogram. Patients needing financial assistance please call (407) 303-1488 for details. Jan 31: Florida Hospital Lady Track Shack 5k at Mead Garden SOLD OUT!